If you are a student, Amazon has a program worth considering, Amazon Student. Among the benefits is 6 months of Amazon Prime for free, which mean FREE Two-Day shipping on millions of items. After the 6 month trial period, you can sign up for Amazon Prime for the discounted rate of $39, half of the normal cost of $79. You will need an .edu email address to sign up. Steam Summer Sale is on Now! If you love computer games, or have a family member who loves computer games, the Steam Summer Sale is on now! For eleven days they have huge savings of up to 75% off over 2000 PC, Mac and Linux titles. Looking to save on an XBOX Live 12-Month Gold Membership? Newegg currently has an eBay Deal for $34.99 with free Standard Shipping. The 12-month XBOX Live Gold Membership retails for $59.99. 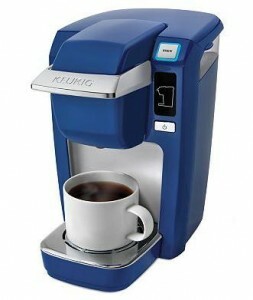 If you are looking for a Keurig K-Cup Brewer, now is a great time get one for a great price at Kohl’s. The Keurig B31 Mini Plus Personal Brewer is regularly $124.99, and is on sale for $99.99. Kohl’s is offering $10 in Kohl’s Cash for every $50 spent from 6/21/13 to 6/30/13. Kohl’s Cash earned during this time can be used from 7/1/13 to 7/14/13. Removable drip tray allows for easy cleanup. Three settings let you brew 6, 8, or 10 ounces in under two minutes. 10 colors to choose from. If you are using a Kohl’s Credit Card, SHIPFREE4U will get you Free Shipping on any purchase. If you are NOT using a Kohl’s Credit Card, FIFTY4USHIP will get you Free Shipping on purchase of $50 or more. Don’t forget to log in through Ebates and earn 6% cash back on your purchase. If you have not signed up for Ebates yet, sign up HERE. Groupon has a deal on a Staples eGiftcard: $25 for a $40 Staples eGift Card. This is one way to save on ink and toner for printing coupons! Staples eGift Cards must be redeemed in store. 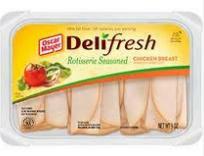 If you are in need of some lunchmeat, Safeway has a great deal this week. You may even have a $1 Just4U Coupon, making it an even better deal ($1.50/each). If you are a Studio Ghibli fan, check out today’s Amazon Gold Box Deal of the Day: Up to 55% Off Studio Ghibli Films on DVD and Blu-Ray. 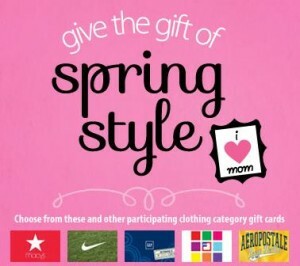 From now until May 11, you will earn 4x Fuel Points when you purchase apparel brand gift cards at Fry’s. Whether you are shopping for mom, or getting some birthday or Christmas shopping done early, this is a great way to save on gas! Here’s an oppertunity to save a bit on books. 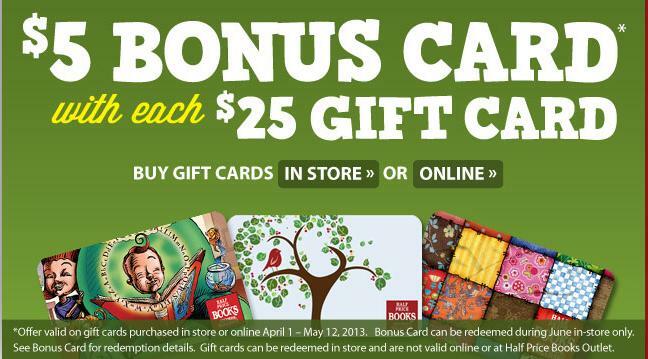 Half Price Books is offering a $5 Bonus Card for each $25 Gift Card you buy from April 1 to May 12. 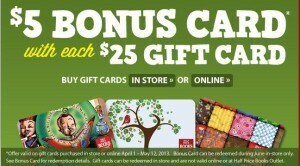 Bonus Card can be redeemed during June in-store only. Gift cards are not valid online or at Half Price Books Outlet. Here are a few of the deals I found at Fry’s tonight. The Mega Sale is going on now (for 2 weeks).